Yesterday’s treadmill run: 5 miles. Thankfully no one tried to talk to me. I kept the pace easy and stopped to stretch I think after each mile. While I wasn’t sore or stiff from Saturday’s treadmill half marathon, I am making an attempt this week to keep things a bit light. If you recall, a few weeks ago I kept saying I was feeling super tired, super drained and not myself. I knew I wasn’t sick but I also know myself pretty well and know that I am NEVER looking to sit down during the day let alone consider laying down to take a nap. Mentally and physically I thought I was fine but I was completely low on energy and distracted in my writing. … Iron deficiency. Anemia. Female Runners and Iron. Female Vegetarian Runners Low Iron. Symptoms of low iron. Fatigue and low iron. Fatigue for female runners and iron. Menstrual Cycle Affect On Iron. 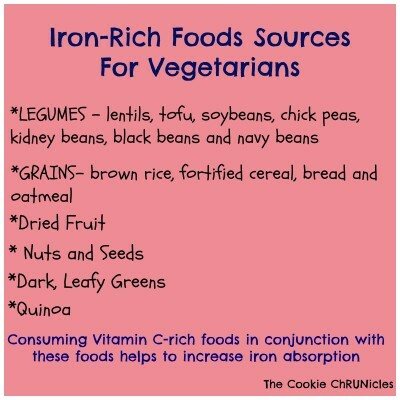 Iron-rich foods. Non-heme vs. Heme iron. 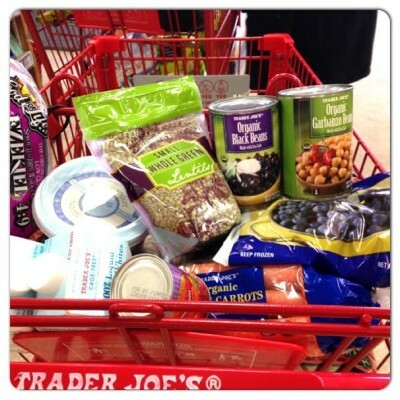 Plant-based iron sources…. Can you see a trend in my searches? I picked up on my own personal trend- I am typically most fatigued AFTER my monthly visitor. While most women feel their best in the days following, it takes me four or five days to reach that point. Well aren’t I just the poster child for an iron issue. Running and hard training in general stimulates your red blood cell production thereby increasing your body’s demand for iron. Did you know that running can actually make you lose iron THROUGH YOUR FEET? Yeah, I didn’t know either. They seem to think that your “foot strike” can cause damage to red blood cells. Hmm. Did you know you lose iron through sweat? And a vegetarian diet? Well, the type of iron consumed through plant-based foods is something called non-heme iron which is not as well absorbed by the body as heme iron found only in animal protein. Running a lot and as often as I do, combined with a vegetarian diet and a monthly visitor who further drains my iron = possible explanation for my lack of energy and fatigue. While a blood test is really the only sure way to know what’s up with the iron levels, it certainly can’t hurt to make a few adjustments to the daily diet. I have decided to make more of a conscious effort to consume iron-rich foods on a regular basis, especially during this un-fun time of the month. I already bumped up my raisin intake and have been making sure to include more lentils and beans in my daily diet. In recent months I had stopped eating as many black beans and chick peas as I had been so I made sure to change that. 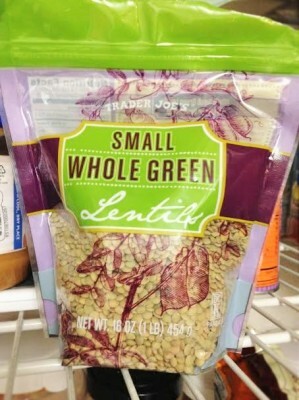 Normally I buy the package of steamed lentils from Trader Joe’s but have now bought the lentils in the bag to start making them myself. Saved a few dollars too! 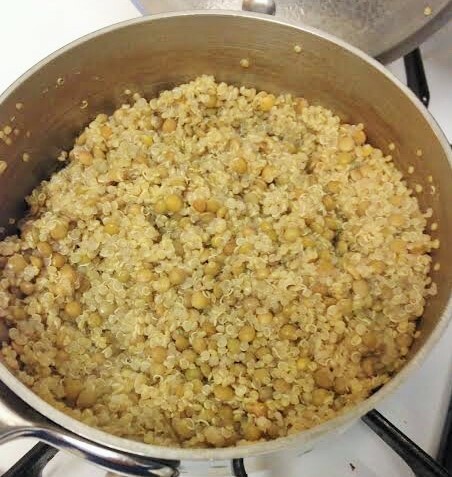 Since I love to combine ingredients, last night I cooked a mix of the lentils and quinoa in one pot. Easy and ready to be eaten throughout the week. One very important thing I learned as well, which I really didn’t want to hear: Coffee (and even tea) affects your ability to absorb iron. Uh huh. Now that I put it out there and we know about it, let’s not talk about it. 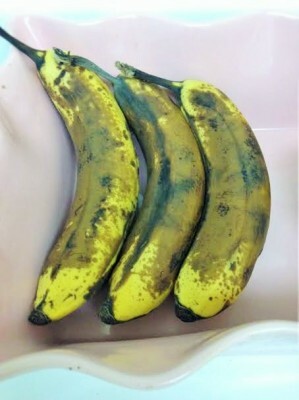 Instead let’s talk about the three overripe bananas staring at me in the kitchen wondering what I will do with them today. Do you take supplements? Is iron one of them? Do you notice a change in your energy levels at different times of the month? Last time you took a nap? They are begging to be sacrificed to banana bread! I’ve dealt with iron deficiency my whole life (despite being a meat eater) and while I’ve tried to up my iron intake, I’ve had to start taking supplements because it got really bad. They kind of mess up my stomach but I’ll take it for not feeling like I’m narcoleptic and lethargic all the time! I don’t feel like making banana bread, isn’t that a shame? I went with muffins so far but still have bananas left to use! I second Davs ^^ banana bread all the way. The only time I struggled with my iron levels was after a few years of being on a veggie diet. It got to the point where I was constantly tired and feeling drained despite the fact that I was trying to focus on a lot of iron-rich foods. Things didn’t get better until I reintroduced meat into my diet, so I’m hoping that you have better luck than I did! Yeah I hope so too as I wasn’t exactly looking to reintroduce meat at this point. Thankfully the only time I had to take iron was after having my 2nd son (I lost a lot of blood and had a transfusion). I’ve always mixed red meat into my diet weekly so I think that helps. A lot of people swear by red meat in order to keep the iron up. I am really bad about supplements, it probably couldn’t hurt me to take iron. I’m glad that I like to eat all of the foods on the iron-rich list. I hadn’t thought of cooking my quinoa and lentils together! I have added strawberries to my quinoa for breakfast, though. Maybe you could do that with bananas. Without the lentils, of course! You know, I bet it would work with the lentils too! It sounds odd but I am pretty sure we would like the texture. Very interesting. As a vegetarian I thought I was very careful about nutrients and vitamins but I don’t think I’ve given iron much consideration. Thanks! Hi! 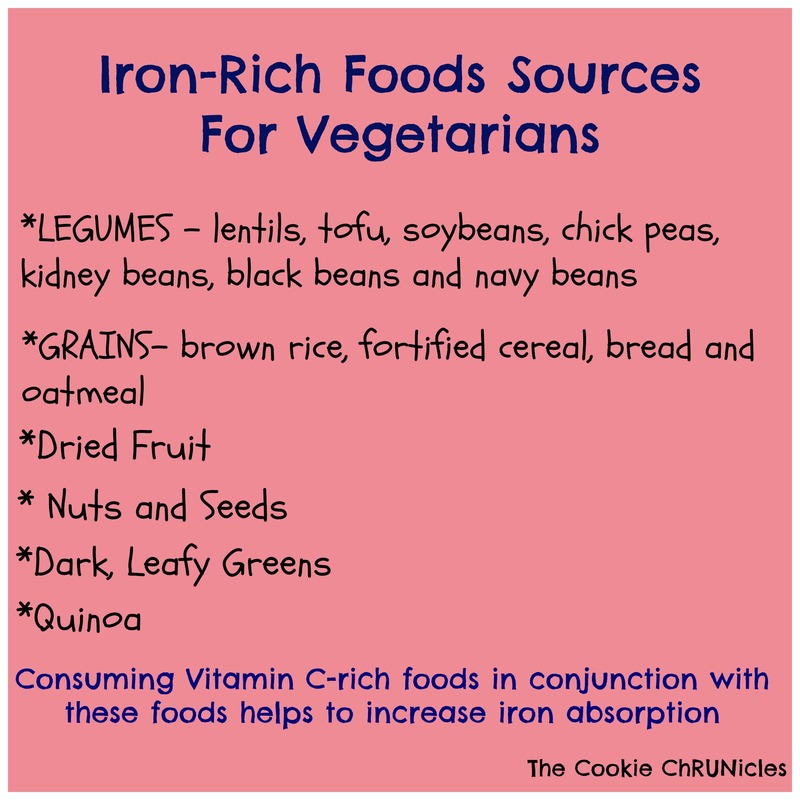 Definitely make sure you are consuming iron rich foods, especially as a vegetarian. I think I feel a noticeable difference in my energy levels this month after focusing on getting in more iron rich foods like lentils and quinoa.